The City of Sergeant Bluff supports business growth, development and innovation. Businesses in Sergeant Bluff benefit from a small and personal city government, an active and engaged residential community and a thriving local business community. Our City staff is prepared to help you develop a plan and find a location that works for you. The Sergeant Bluff Community Development Corporation (SBCDC) is devoted to enriching the quality of life of the citizens of Sergeant Bluff by working collaboratively toward the goal of social, economic and housing opportunities, while strengthening businesses, individuals, families and neighborhoods. The SBCDC strives to improve our community through the development of multiple housing options while also enhancing the economic alternatives available in our area to make Sergeant Bluff the community of choice in the region. The SBCDC meets on the fourth Thursday of the month at 11:30 AM at City Hall. Land located along Dogwood Trail is now available for immediate development. 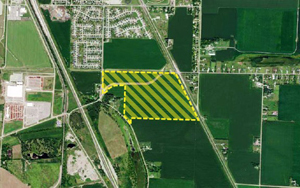 The Iowa Economic Development Authority (IEDA), working with the Sergeant Bluff Community Development Corporation (SBCDC), has registered the 117 acre light industrial/light manufacturing ground in its site certification program.